The book, which features recipes from leading crime authors including Ian Rankin, Val McDermid and Jeffery Deaver, is one of five books on the shortlist for `Best Charity and Fund Raising in Europe'. The awards will be announced at Carrousel Du Louvre in Paris on Saturday February 23rd. “We are absolutely delighted that the Killer Cookbook is being given international recognition,” said Emily Dewhurst, from the Million For A Morgue campaign. “The book has been really well received and we must say a big thank you once again to all of our contributors. 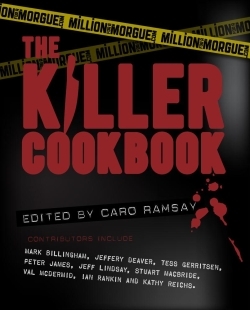 The Killer Cookbook was edited by Caro Ramsay and illustrated by Steve Carroll. All monies raised from sales of the book go to the Million For A Morgue campaign, which aims to raise £1million to help the University of Dundee build a world-leading forensic centre based around the pioneering method of Thiel embalming.